We love Smoked Tri-Tip around the Pacific Northwest! It’s lean, delicious, and quick to cook on a smoker or grill. By understanding a few secrets to perfectly smoking this cut of beef, you can learn to love it too. It’s the #1 cut of beef we cook at home. This is mostly because it’s the #1 requested meat we cook at our Ember and Vine catering events. And that is because it’s a much more affordable option to brisket, both in price and the time it takes to cook. Tri-Tip averages around 60-90 minutes to cook, whereas brisket can take you 10+ hours. That’s a serious commitment! With Tri-Tip there is little commitment to reap excellent rewards! You’ll find they range from 1-½ lbs to 3-lbs. We like them somewhere around the 2-lb range. It has incredible flavor when smoked and is pretty lean. Because it’s so lean it’s important not to overcook it. We see a lot of Tri-Tip recipes where folks will smoke it for several hours. In our experience we’ve found that is not necessary. Seriously, around 60-90 minutes set to an average cooking temperature of 225 is all you need to cook it to a medium rare (which is what we suggest), or just a little bit longer for medium. You want to cook it until the thickest part of the meat is registering around 127 with an instant-read digital thermometer. That’s the happy spot. And you don’t even need a smoker to attain that optimal smoke flavor. We like to use just a few wood chunks on our Weber Kettle Grill and prep the grill for indirect cooking. The trick for keeping the heat low, is using a small amount of charcoal and placing it around the edge of the grill. 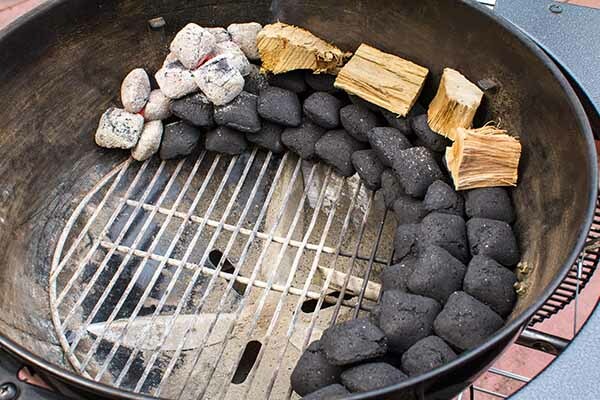 On top of those coals, you add your wood chunks. Use your chimney starter and a few coals to get a heat base, and then place the starter coals at the front of the line of charcoal. It will then slowly light the other coals as if it’s a fuse. As the heat continues along your charcoal line or train, the wood chunks will also light and create the smoky flavor. This allows for a much lower temperature and easier control. Once the temperature of the meat reaches 127 (or somewhere right between 125-130) we pull it off, wrap it in foil, and put it into a cooler (without ice!). This is an important step! This will act as a warmer and allow the meat to continue cooking and allow the juices to slowly redistribute evenly. We like to leave it in the cooler for 30 minutes to 1 hour (usually closer to 1 hour). 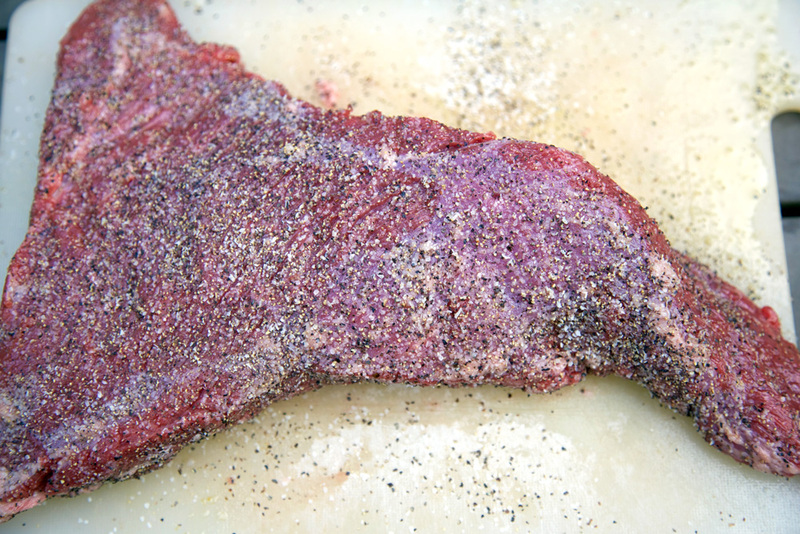 You can marinate or use your favorite dry rub to season your Tri-Tip if you wish, but we like to keep it simple and go with a liberal amount of salt and pepper. That’s it! This is exactly how we cook this for events, and we’ve always received high praise for this smoky deliciousness. 1. Prepare your Weber Kettle Grill for indirect grilling, using a train of unlit charcoal along the outer edge of one side. On top of the train, add your wood chunks. 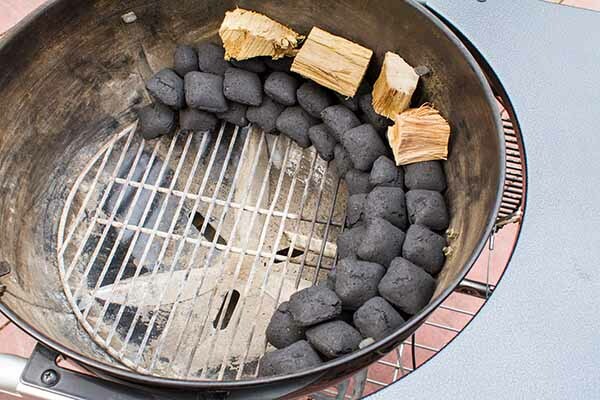 Add roughly 10 lit briquettes to the beginning of your charcoal train, where it will light it like a fuse and place a wood chunk on top. Let the grill preheat, with the lid closed, until it reaches 225 degrees. 2. Cover the tri-tip in olive oil and sprinkle liberally with salt and pepper. I mean it when I say "liberally". Don't be afraid to get a nice crust on there! You can do this the night before if you like. 3. Place tri-tip on the grill, over indirect heat, unwrapped for 60-90 minutes. Cook until internal temperature reaches 127 (or up to 130 degrees) for medium rare to medium and remove. 4. Wrap tri-tip in foil and place in a small cooler (with NO ice) to keep warm for anywhere from 30-60 minutes. This will continue the cooking process thus the medium doneness. Further I have found that it makes the cut extremely tender as the juices slowly redistribute into the meat. 5. Cut across the grains in thin strips and serve with favorite sides, like smoked collard greens, or top with chimichurri sauce. 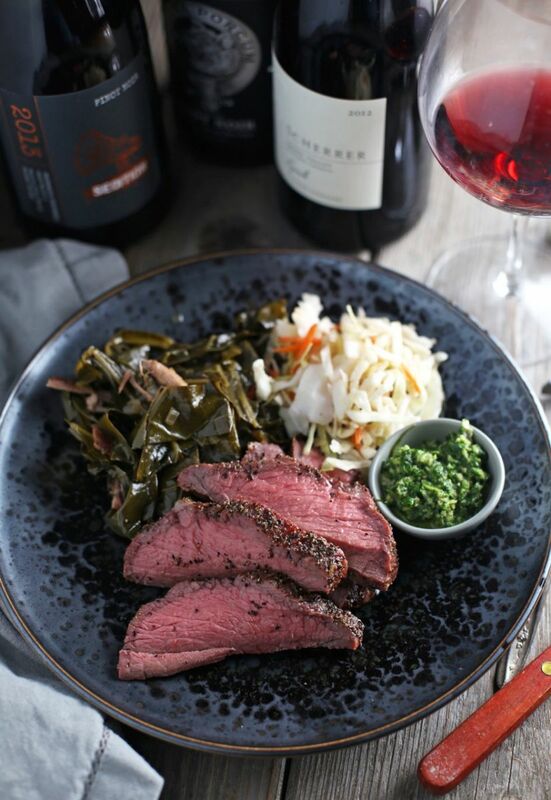 One of my favorite things about Tri-Tip is its versatility with wine! Watch out for heat though, if your rub has cayenne that can mute the wine. One of the reasons I think it’s so popular at our catering events is that it’s fantastic with a full-bodied style Pinot Noir (and we do most of our events in Oregon wine country, aka Pinot country). Most people just associate Pinot with pork or salmon, but it can totally work with beef, especially this cut. Again, this is because this is a lean cut of beef, and therefore doesn’t need some big tannic wine that will work with a fattier cut of meat. It also takes on some great savory characteristics from the smoke and rub (or salt and pepper), which are to die for with the savoriness of a good Pinot Noir. Juicy, lean, tender, and delicious. You can easily pair this with something bigger, like Syrah, Merlot, Malbec, Tempranillo, but don’t be afraid to try it with Pinot Noir (especially a bigger style Pinot like those from California). For more information about smoking on a kettle, check out this blog post! Learn more about pairing wine with grilled and smoked foods on Mary's blog. Follow her on Facebook, Instagram and Twitter!